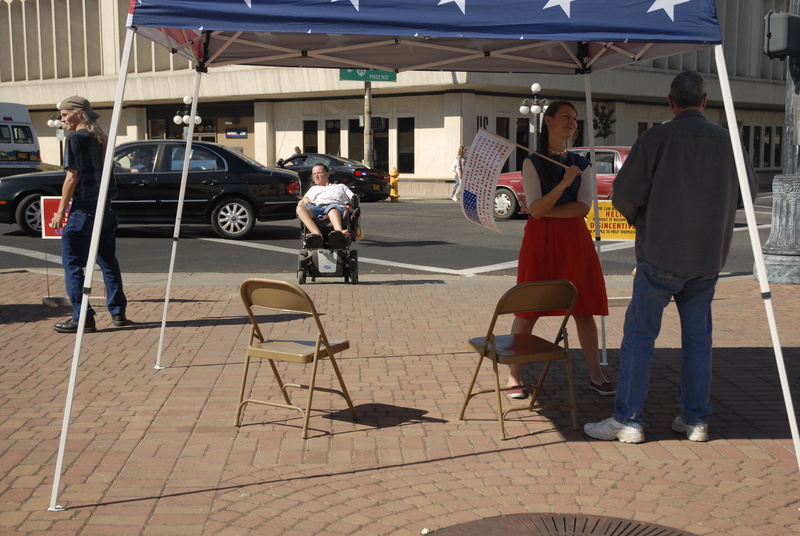 I set up the tent with some of my questioning political lawn sign in the plaza in downtown Medford. A number of the people walking by gave me weird looks and asked me what I was trying to do – whose side I was trying to persuade them towards. It was strangely satisfying to have people not immediately know how to categorize my political position and try to puzzle it out. I explained that I wasn’t trying to convince anyone of anything, that I instead wanted to hear what they had to say. 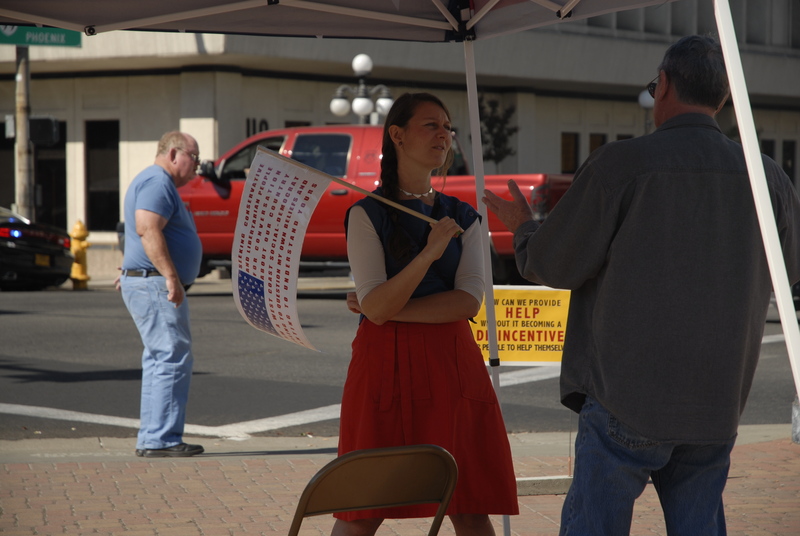 A man stopped to talk who described himself as fairly conservative but open minded. He mentioned right off the bat that he didn’t care much about the gay marriage issue and I assumed that meant he fell within the fiscally conservative and socially libertarian camp of conservatism-where people pride themselves on trying to keep politics out of people’s private lives. He told me he had been in Berkley in the 1960’s and that he took part in the student protests, but that afterwards he had noticed how none of the protesters wanted to clean up the ruckus. He felt that everybody just wanted the excitement and the glory of their righteousness, not the mess they had taken part in making. His sense that the protesters weren’t doing their own dirty work and were letting it fall on others pushed him towards becoming more conservative. He continued on, saying that he didn’t believe in being forced to give to others, by which he meant government assistance is a way of forcing people, through tax code, to give to their fellow citizens whether they want to or not. He said he thought people should only give through love, when they feel in their heart they want to. I said that sounded good to me, but what about giving out of a sense of duty to what is good for the greater group of us as Americans in the long run? He said sure, but he didn’t think redistribution of wealth was good for us. We went back and forth for a while on this and other issues and it started to feel more and more like we were both re-hashing the common stances of our respected political allegiances. At some point he asked me whether I believed in evil and told me that if I didn’t I was a relativist. He followed that up by saying that according to relativist logic there could be no line drawn between gay people consummating the love in their hearts with marriage and people who wanted to marry their brother, or their animal. I tried to respond by saying that it was clearly different and that there is a biological basis for being gay, that it isn’t just a choice, but he said, “there you go with that liberal gay agenda logic.” I was confused. I noticed my heart was rushing. I said to him, “it feels as if we are just hearing each other as examples of the media spin about people on the other side.” I tried to pull us back from that predictable dance a couple of times and find more substance, but we just kept sounding clichéd to each other and it got too frustrating. Afterwards I thought about how many times during this project I’ve felt that reason has let me down, either because I lacked a good enough grip on it, or because it didn’t matter whether I had it or not. Often I cannot construct a convincing enough argument for my point of view to get through to someone who doesn’t believe what I do. Partially this is just my personal lack: I am not actually that great at rhetoric, at saying my opinion in a persuasive way, nor am I a policy person with all of the political facts to back me up. But most of us are not rhetoricians and policy wonks, and the problems are more basic than that. Do we even know what we believe and why we believe it? And if we do, how clearly can we say it? And if we can speak it, will it be in language that someone who doesn’t share our beliefs can hear? And are they even really listening to us or more to something they have already heard? This past summer me and my good friend recorded ourselves trying to explain why we are pro-choice, and while we obviously believe and respect our own explanations, listening to that recording I could hear how both my logic and my wording were not entirely solid. Articulating what we believe in our own way – and knowing why we believe what we do – is not so straightforward as it sounds. The hope is that the clear expression of reasoned perspectives can function as a bridge between different people’s points of view, but that is rarely how we relate, or what forms ties between us in normal life. Is it even realistic to expect ourselves to reason out the beliefs that we hold in ourselves as felt forces? Still, for however little this man and me got through to each other, I respect some of his points, like what he said about the importance of cleaning up after protests. I am all for taking responsibility for the boring work as well as the exciting stuff. And I agree with the feeling that we should be helping people out of love and not out of governmental compulsion, but I don’t think that the real inequities of American society can be dealt with on a personal level, I think they need institutional change.